Since 1984, Treasure Garden has manufactured the widest selection of shade products in the world. They offer more than 25,000 variations of shade solutions and accessories. From their state-of-the-art Cantilevers to their Collar Tilt collections, Treasure Garden has a perfect shade solution for your outdoor environment. These grade fabrics include 100% Solution-Dyed Acrylic fabrics from the top U.S. mills including Sunbrella and Outdura. These all-weather fabrics offer a five (5) year warranty covering loss of color or strength from normal exposure including sunlight, mildew or rot. Treasure Garden's exclusive, best performing, 100% Solution-Dyed Polyester 4800 series fabric. These durable all-weather fabrics offer a four (4) year warranty covering loss of color or strength from normal exposure including sunlight, mildew or rot. This 100% Solution-Dyed Polyester offers the outdoor casual furniture industry an ideal earth friendly solution and is truly the 100% recyclable “GREEN” choice. Grade D Fabrics are made of 100% Solution-Dyed Soft Olefin. These fabrics offers a great value with a wide assortment of colors. These all-weather fabrics offers a two (2) year warranty covering loss of color or strength from normal exposure including sunlight, mildew or rot. Solar radiation can dramatically change the temperatures of an object that it hits, heating it far above the actual air temperature. The proper shade over your dining or deep seating areas can reduce the temperature up to 20%. A sweltering 95° can become a comfortable 80° with the proper shade! Read the Science behind Shade to find the best umbrella or cantilever that will cover your dining or deep seating. 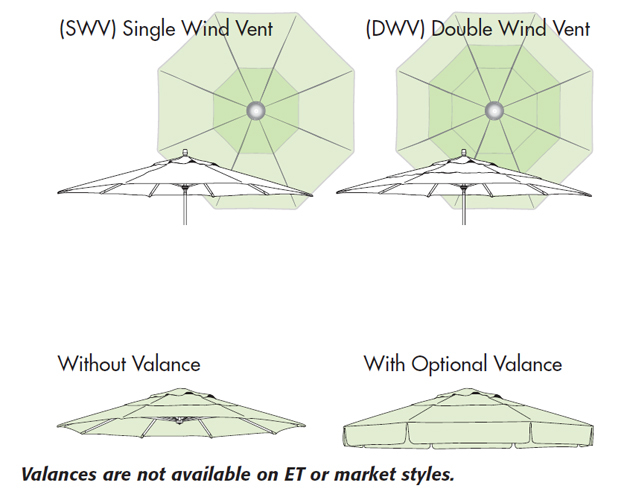 Most umbrellas Treasure Garden offers are made with a Single Wind Vent (SWV),unless otherwise stated. Double Wind Vents (DWV) are optional and available on select models. SWV: Single Wind Vents are sufficient for most applications. DWV: Double Wind Vents are typically used for application where the wind is a significant factor, as well as an additional design element.